The Baja California peninsula is one of the most arid areas in Mexico and water shortages are becoming critical, especially along the southern coastline which has matured into one of the most desirable jet-set locations in the world. Desalination, which involves removing the salts from seawater or brackish water to provide drinking water, is one viable option to ensure future water security for the region. There are already about 70 desalination plants on the Peninsula, though most are very small (25 liters/second or less) and are powered by conventional electricity. Several larger desalination projects on the Baja California Peninsula, some of which will rely mainly on solar power, are currently in the planning stages. La Paz, the capital of the state of Baja California Sur, faces a particularly serious water supply problem. The local aquifer is reported to be already overexploited and suffering from salt water intrusions. Because of its greater density, seawater normally underlies freshwater in coastal areas. Salt water intrusions occur when so much fresh water is pumped out of coastal aquifers that it is replaced by the underlying salt water. The water supply issues have led to water rationing, in which almost half of La Paz’s 250,000 residents receive water only 12 hours or less each day. Obtaining water from the desalinization of sea water is more expensive than abstracting water from aquifers via wells, but avoids the possibility of salt water intrusions. Cabo San Lucas, opened in 2007, treats approximately 230 liters a second (60 gallons/s), equivalent to 20 million liters (5 million gallons) a day. La Paz. Still at the proposal stage is a desalination plant capable of treating 200 liters a second. Sierra de la Laguna. A Canadian mining company (Vista Gold Corp.) planned a desalination plant to provide water for its proposed Concordia open-pit mine. However, the mining plan was refused an essential permit by the Mexican government. Ensenada. The 28-million-dollar El Salitral desalination plant is a “highly innovative project that would put the region on the map globally for desalination”. Construction is due to start later this year, and the plant should be operational by the end of 2012, when it will treat 250 liters of seawater a second. The plant would supply 96,000 people with potable water. Rosarito. Preliminary geological and environmental impact studies are underway for a desalination facility in La Misión large enough to supply the needs of 96,000 people. Still in the concept stage is a second desalination plant which would supply water across the border to San Diego in California. 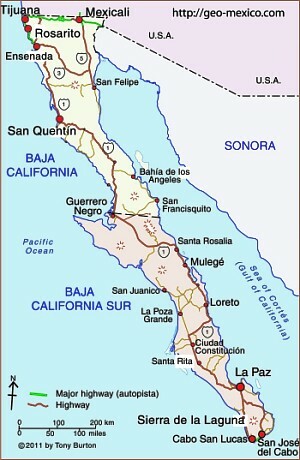 San Quintín. Plans exist for a desalination plant with a capacity of 150 liters a second. “Construction is due to start later this year, and the plant should be operational by the end of 2012” . . . IT IS CURRENTLY NOVEMBER 2014!